The United Nations says Yemeni political factions have agreed to a humanitarian ceasefire during the holy fasting month of Ramadan. Yemeni political factions have agreed to a humanitarian ceasefire during the holy fasting month of Ramadan as consultations continue in Geneva for the settlement of the crisis in the Arab country, a UN spokesman says. “The parties of the Yemeni interlocutors with the United Nations agreed to declare a humanitarian truce with the beginning of the holy month of Ramadan,” Ahmad Fawzi said in a statement on Thursday, Sputnik news agency reported. million people who are now in need of humanitarian assistance,” Fawzi said. UN secretary General Ban Ki-moon had earlier asked for a month-long humanitarian truce. 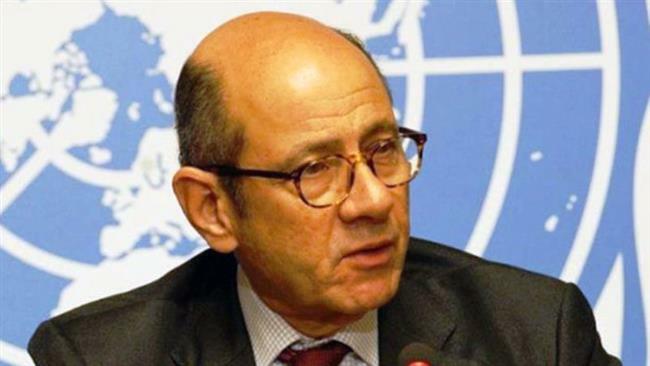 In his address to the opening of Geneva negotiations on Monday, Ban said Ramadan could be a time for “reflection, harmony and reconciliation” in Yemen. The UN-backed peace talks are expected to continue until Saturday. Yemeni political factions, including representatives of the Ansraullah Houthi movement and members of the ousted government of the Abd Rabbuh Mansour Hadi are attending the talks. The fugitive president is currently in Saudi Arabia, where he has been supporting the kingdom’s three-month-long aggression against Yemen. Riyadh started its military campaign against the Arabian Peninsula nation on March 26 – without a UN mandate – in an attempt to weaken the Houthi Ansarullah movement and bring Hadi back to power. The United Nations says at least 2,600 people have been killed and 11,000 others wounded due to the conflict in Yemen since March 19. UN Human Rights spokesman Rupert Colville said on June 16 that at least 1,412 civilians, including 210 women, have been killed and a further 3,423 injured since March 26.